This weekend my twin girls received their first car. It came a bit early, but was a great deal from a good friend, so…. dad jumped on it. I took the girls out to practice in a local church parking lot. 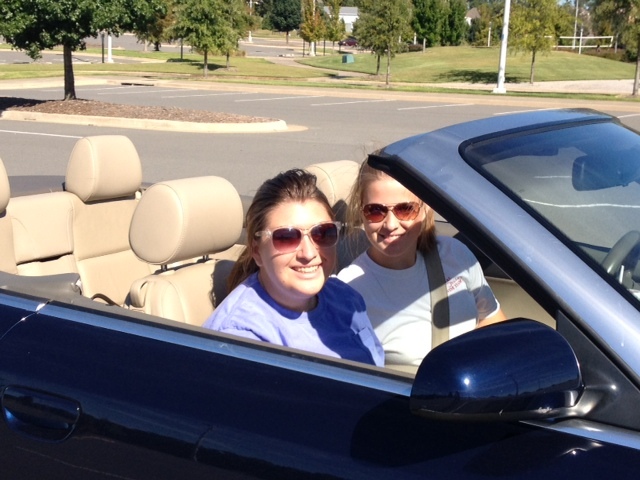 It was a perfect day for having the top down and radio playing. They did a great job, with minimal input from me. It is easy as a Second Season Mom to get stuck in the middle. There’s a lot of water under the bridge, but there is so much still in front of us. Some days I feel like I am wandering in the valley, exhausted from the trip up and over one mountain, afraid to start the journey up the next. As I have said before, I am taking this journey slowly. I want to get it right. I know I can learn and I know through His grace and wisdom I can grow and change. I’m not the mom today I was five years ago. The yelling is gone and the obsession over the “to do list” has been put to rest. I am choosing not to regret, but to be thankful I have changed and to hope my girls have seen the change and know its source. As a little side treat I am attaching a great Teen Driving Contract you might want to check out. It is from one of my favorite Christian authors and speakers Lysa Terkeurst. You can find her blog at http://lysaterkeurst.com/. Go to the Freebies section and you will find this contract with some other GREAT resources. ← Keep it Together Mom!